Sitting late or working late? So how much can you learn? In response to reader’s comments from my previous post, I have updated the code for this little thingy. Here are the updates in this version. 2) Made the grid rows double clickable. On double click, a window opens up with the selected row which can then be updated. 3) Removed the inline editing as didnt want the confusion of inline editing and double clickable rows. 4) The same “Add Artist” is used for add/update. 5) Changed the CFC to accomodate the update functionality. 6) Fixed a couple bugs and general code optimization and added some more comments in the code. Oh, here is the code. And for those, who want to see how it looks now, before trying, here is a little screen grab. Hi Anuj, this is a great example, but I can’t seem to get it to work in IE7. I get “‘dataproxy’ is null or not an object” any help is greatly appreciated. Because having the same name for the proxy and the variable breaks things, apaprently. you first call the cfajaxproxy tag like this. <cfajaxproxy cfc=”data” jsclassname=”cfcproxy”> (notice i changed the name to cfcproxy . Thanks for doing this example! I’ve been trying to figure out how to use grids since I got CF 8. Is there anything different I need to do in the add window? I have even tried to use the parseInt() function around my variable. Any suggestions? @Jeff, looks like something you will have to debug. Try debugging and see what values are being passed in to the CFC, or show me your code and I can take a look. I haven’t started yet, but I’m going to use your code but change the drop down box to filter the grid by a specific columns. Any examples or suggestions? BTW I’m loving your blog! WOOHOO!! @knk, are you saying you want to control which columns you want to hide/show ? If yes, I think there is something already tehre in the Ext library for that. Will have to search a bit. And, glad that you are liking the blog. 🙂 Thanks for the nice words. @knk, you are filtering on whats available and thats just the page you see, so whats happening is right. In order to do a server-side filter, you would have to call the CFC and reload the grid data. Where should I start? Can you give me some direction please? and make sure the CFc would accept that parameter and run the wuery based on that. Another question. I want to add another column to grid that has a hyperlink called Edit. Each row will have a Edit link. I can’t seem to make the href attributes work correctly. I added the column on but it just displays a small line in the column I added? Any Suggestions? @knk, Probably you need a cell renderer. The way I was trying to go is…. I’m still curious and interested on adding another column and just using text or passing a string to use as a link. @knk, href and hrefkey should work just fine. this should correctly make your column a link. I used your code as the basis for my grid. Some of my data in the columns are links to other pages using the href parameter of the cfgridcolumn. If the data for the row is null, the grid puts a space in the cell and I get a _ (link) in the cell. I tried to catch the null with a listner put can’t seem to get the right solution. How can I do this? // this function recieves the response from CFC whenever a CFC function is called. // we are simply alerting the response but we could do more if we had to. // add a row double click event for the grid rows. // the double click will open a popup window for editing the row. @Jim, Sorry your comment was stuck in spam and I just noticed. So, is the problem solved or not yet? did you try alerting mycf to see what it was returning? Yes, I did solve my problem of having a null linked in a cell. You need to do the link with a function, which gives you and opportunity to also intraigate the data and link accordingly. I also found how to control the column alignment with css. Below is my current code. One last question to answer: If columns are moved, how can I save the grid structure and then restore it on the next visit to the page? Very clean interface, I love it! I have hyperlinks below the grid: Add, Edit and Delete. When the user clicks add, it redirects to an “add user” form. However, for the edit hyperlink, I would like to be able to pass the id of the CFGRID row that the user selects….in other words, the user would first select the row he wants to edit, then click on the “edit user” hyperlink, which would link to “userForm_edit?userID=#userID#”. My problem is that I cannot get that #userID# variable passed…it says that the variable is undefined. Another great example, tank’s Mr. Anuj !!!! But j’ve a little problem, i’ve make many tests with different browser but after a modify of a record, cfgrid wont refresh..
I’ve try to insert in the page a “killer cache” with cfheader, i’ve try to modify caching method in the browser, i’ve installed last coldfusion patch but cfgrid wont refresh again !!! I am using your code as a base for my table maintenance and am really impressed with how it works. It served as a great example for me to expand my Ajax and CF knowledge. I’ve been successful in adding checkboxes and calendar controls but am having a small problem with drop downs. When I’m updating a row, in some cases the drop down automatically positions itself to the correct entry for a field, while in others it starts at the beginning of the list. And in each case I appear to be using the same code!! I know I must be mising something here, but I can’t figure out why one list goes to the value while the other doesn’t! Can you offer any suggestion? Not sure why the above post left out all my CFML, but it did. I finally figured out the reason for the difference in the two cases I tried to describe above and it was caused by the fact that the data going into the drop-down control was not identical to the values in the option list. Apparently when you assign a value to the form drop-down object, it validates it against the items in the option list and if it doesn’t match one of them, the assignment is not made (and there is no error raised). I had no idea that it would do that kind of validation during an assignment of a value from a variable to a form object. First off great series. I have been using your tutorial and has been workin like a charm. I want to use the addWin as a search screen to filter the data based on the form values entered by the user… is this possible? i tried using a function similar to the saveArtists but i cant seem to get it to work..
would u be able to help me out.. this seems to be hard to find on the web.. 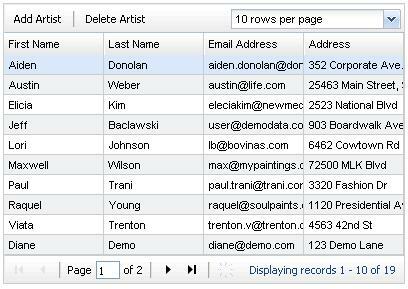 The following code snippet comes from an example that lets users delete rows from a grid. When the user selects a grid row and clicks the delete button, the AJAX proxy calls a mycfc.deleteRow function to delete the row from the database. When the function returns successfully, the proxy calls ColdFusion.Grid.refresh to update the grid and remove the row. my grid is bindable so I’m not using a button so do you know another way for me to use this refresh statement. wouldnt that be the onChange attribute of the cfgrid? you call the cfc’s update() function in the onChange – doesnt that update your grid ? Yes my grid updates just fine, I see the red triangle to show the update but I need to also refresh the grid because the update affects another column that doesn’t show unless you refresh the grid. Well, onChange should refresh your grid row. But if it doesnt for whatever reason, the only thing I can think of is call a JS function in your onchange and do the Update CFC call there and then run your Grid.Refresh call. Thanks I’m using an event listener to handle it. so you solved it? mind posting the code here for others? I sent an email with the code to info@anujgakhar.com so see if you can post it. Just approved your previous posts with the code. For some reason, they were marked as spam. Ok thanks, hope this helps someone. I’m just testing some new features I’ve written on an application and I’m testing it on my desktop with Win 7 and CF9 but unrelated things are failing. Is this my bug or is there a need to redo some of this for CF9 now? I am using your updated code above with modification for my data. I am however, not able to get the data to populate the CFGRID. I receive a exception error thrown line 798 cfajax.js which points to sytaxerror(“parseJSON”). What could I have left out or need to update to get this to work?